The latest installment of the Mass Effect series has taken inspiration from some of the best games of recent years. Anything Mass Effect 2 could do, Mass Effect 3 can do, too, and better besides. That's the word from BioWare, which says that not only will the action be more impressive in ME3, but the RPG elements will be much deeper as well. In fact, BioWare's marketing director, David Silverman, said that that Mass Effect 3 was the best game that the developer has ever made at its Edmonton office. He said that the game struck a balance between the action - which BioWare wants to be on a par with the best action games around - and the RPG side, which he admitted could have been deeper in Mass Effect 2. Silverman said that BioWare hadn't wanted to go so far down the RPG route that Shepard started breaking out his dice, but at the same time wanted to give players the chance to really customize their characters. "We've done a lot of research about what people liked about Mass Effect, Mass Effect 2 and other games too," said Silverman. "What they like about Gears of War, Assassin's Creed, Halo, Call of Duty and lots of RPG games, too ... We've looked at all these games to see what's resonating and what's not." Getting the perfect balance between RPG and action is no mean feat. The first Mass Effect arguably had far too many numbers to crunch thanks to the staggering number of inventory options, while the second arguably had too few, with skills cut down to the barest of essentials and inventory management all but gone. It wouldn't surprise me if the game took a similar route to Dragon age 2, and presented the player with all kinds of options, while leaving NPCs equipment fairly constant throughout the game, with upgrades to be found scattered across the galaxy. 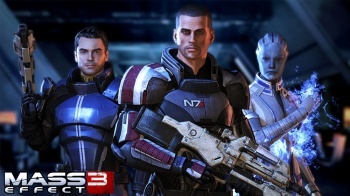 Of course, no matter what else happens, Mass Effect 3 will almost certainly be a good game. If BioWare does manage to get the balance just about right though, it might skip the "good" stage entirely and go straight to "great," or perhaps even "darn near perfect."